The area of a circle is number of square units inside the circle. Standard formula to calculate the area of a circle is: A=πr². If we know the radius then we can calculate the area of a circle using formula: A=πr² (Here A is the area of the circle and r is radius). 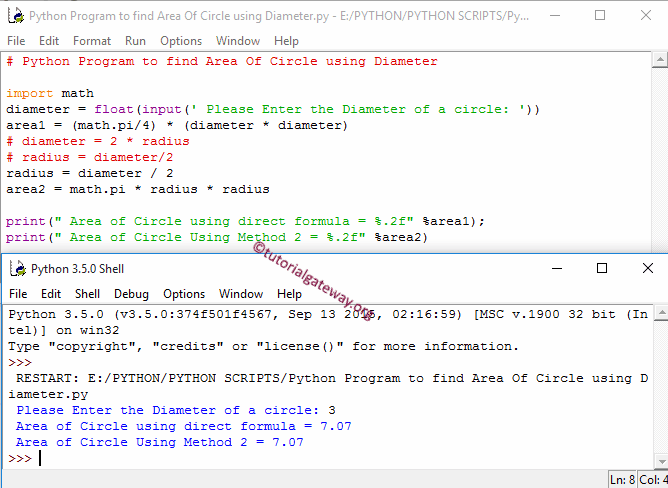 In this python program, we will find area of a circle using radius. ANALYSIS: We defined pi as global variable and assigned value as 3.14. This program allows user to enter the value of a radius and then it will calculate the area of circle as per the formula. Next line of code allows user to enter the value of a circumference. ANALYSIS: This area of a circle program allows user to enter the diameter value. Next, it will calculate the area of circle as per the formula we shown above. We also mentioned other approach.